Igniting interest in sailing in China represents one of the greatest challenges for our industry with the alluring prospect of creating a 'market' in the nation with the largest population in the world and with one of the fastest growing economies - hence the all-important Volvo Ocean Race stopover in Sanya, the Exteme Sailing Series and Clipper Round the World Race visiting Qingdao, etc. While Beijing is the capital of China, Shanghai represents arguably its most important city having the largest population of not just any Chinese city, but any city in the world, being a major international financial hub and having the world's largest container port. It also has a river. So the race has been on getting our sport into the heart of progressive China. The Clipper Round the World Race set the ball rolling when it visited Shanghai in 1996 and in subsequent races, although this involved stopping the race well offshore. While the Extreme Sailing Series and a Land Rover-backed Extreme 40 last month became 'the first professional racing yacht to sail down Shanghai's Huangpu River, one of the busiest waterways in the world', Sir Keith Mills' company Five° West yesterday unveiled the 2015 Shanghai International Regatta, 'the first professional sailing event to take place on the Huangpu River'. This event will take place alongside a boat show, Yachting Shanghai 2015, over three days - 10-12 July. From a sailing perspective the Regatta will form three parts. The Moth Invitational will see foil-born boats racing in China for the first time. On board the 12 boats taking part on the Huangpu River will be some of the top international Moth sailors including Chris Rashley (GBR), ex-World Champion Josh McKnight (AUS) and two time UK National Champ Jason Belben. In these, the former America’s Cup World Series syndicate, China Team, will represent China and will line up against Team GREAT Britain, that will race under the colours of The GREAT Britain Campaign, which works to showcase 'the very best of what Britain has to offer'. 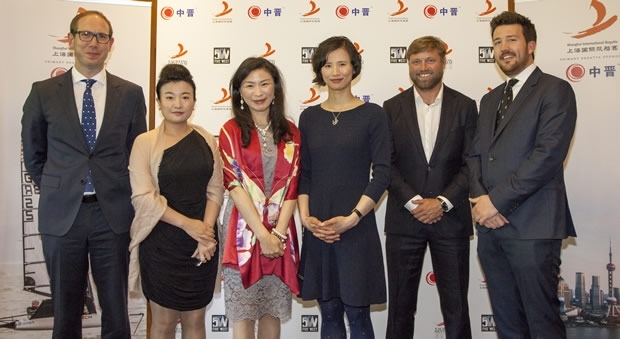 Official Regatta Ambassadors for the event will be China's Olympic Laser Radial Gold Medallist from London 2012, Lijia Xu [who FYI has given up Olympic sailing to study 'management' at university in - of all places - Southampton] and Alex Thomson. Finally on the Sunday will be the 'Bund Run', which in addition to those competing elsewhere in the Shanghai International Regatta aims to gets local sailing boats (as there are) out on to the water en masse to take part in a 6km race along this section of water known as 'the Bund' form the Bund Tower to the Expo Centre. The organisers are hoping that in this first year they might round up 15 local boats for the Bund Run. The aim of Shanghai International Regatta is for it to be held annually from this year on. Shanghai International Regatta has as its 'Primary Regatta Sponsor', ZhongJin - one of Shanghai’s leading Asset Management companies and the event will be known as the Shanghai International Regatta presented by ZhongJin. ZhongJin is owned by Guotai Investment Holdings Co., Ltd., and mainly focuses on the asset management, investment banking, fund management and private banking sectors. Guotai is a large-scaled joint venture company, with a number of subsidiaries in private aviation leasing and operations, pilot training, financial management, leisure and tourism. Yuan Wang, Chairwoman Yuanzhou Cultural Communications, co-organiser of the regatta said at the briefing: "140 years ago, in 1873, a sailing event called ‘Shanghai Cup Regatta’ was held on Huangpu River, so today it is with great pleasure that we present the ZhongJin Shanghai International Regatta 2015 presented by Yachting Shanghai as a continuation of the legacy of yachting culture in Shanghai." The regatta will be held at Shanghai's Pu River basin between Lupu Bridge and Nanpu Bridge, between the World Expo Park and will provide spectators with a great view from the river bank. Supported by Expo Shanghai Group the event will be co-organised by Shanghai Yuanzhou Cultural and Five West. The event has gained local governmental support from Shanghai Municipal Tourism Administration, Shanghai Municipal Transportation Commission, Shanghai Maritime Safety Administration, Shanghai Sports Administration.